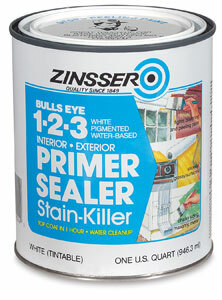 Zinsser Bulls Eye 1-2-3 Latex Primer Sealer is a fast-drying, white-pigmented acrylic latex (water-thinnable) undercoater. Any oil or latex paint can be applied over it. 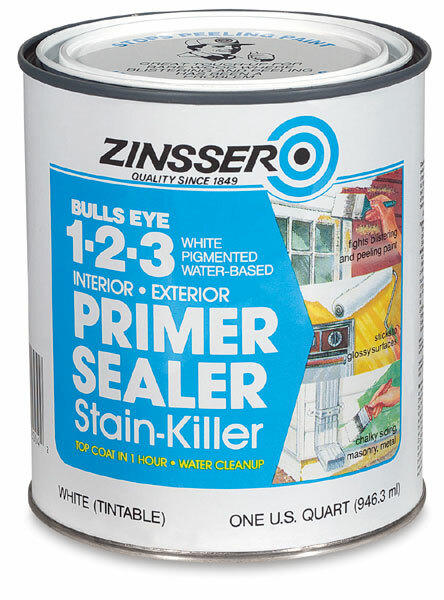 Use it on all interior and exterior surfaces. 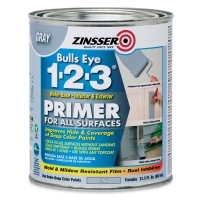 Bulls Eye 1-2-3 can be used on damp surfaces, because it lets moisture escape. It can be used on chalky, weathered surfaces without washing, and on glossy surfaces without sanding. It even adheres to galvanized metal. Drying time is 60 minutes. Clean up with soap and water. Quart (0.95 L) and gallon (3.79 L) cans. ™ Bulls Eye is a trademark.